Snowpack accumulations rose even further above average in Colorado as a whole last month, but they continue to lag in the southwest part of the state. The statewide snow water equivalent was at 118 percent of median Thursday, compared to 107 at the start of February, thanks to multiple storms, the Natural Resources Conservation Service says. The Upper Colorado River Basin was at 129 percent and the Gunnison Basin, 112 percent. The Laramie/North Platte and South Platte basins are even higher than the Upper Colorado, with the South Platte at 144 percent of median. But southwest Colorado remains a different story, with the combined San Miguel, Dolores, Animas and San Juan basins at 95 percent of median and the upper Rio Grande at just 90 percent. The good news for the southwest is that snowpack levels rose from Feb. 1 levels of just 82 percent for the Upper Rio Grande basin and 79 percent for the four other basins. On a statewide basis, Colorado has received above-average precipitation for three months in a row, the conservation service says. The state usually reaches peak snow accumulation on April 9, and under current conditions only needs 8 percent of typical precipitation between now and then to reach that peak, Hultstrand said. The Upper Colorado Basin already is an inch above the 15.5 inches of snow-water equivalent it reaches during its typical peak. Natural Resouces Conservation Services says that while reservoir storage is still below average, at 89 percent, that’s much improved from the 67 percent at this time last year. “With the current snowpack conditions and storage volumes, drought conditions in most basins should be alleviated and reservoir storage should improve this spring,” the agency said in a news release Thursday. Arkansas River Basin snowpack reached 109 percent of the median as of March 1, increasing from 100 percent in early February. Statewide snowpack was 116 percent of median, and statewide precipitation totals for February reached 133 percent of average, said Phyllis Ann Philipps, Colorado state conservationist with the U.S. Department of Agriculture Natural Resources Conservation Service. Snowpack exceeded the median in every basin except the Rio Grande, at 79 percent, and the San Miguel, Dolores, Animas and San Juan basins, at 85 percent of median. However, the combined San Juan basins saw a 3-percentage-point increase from last month and reached 103 percent of last year. 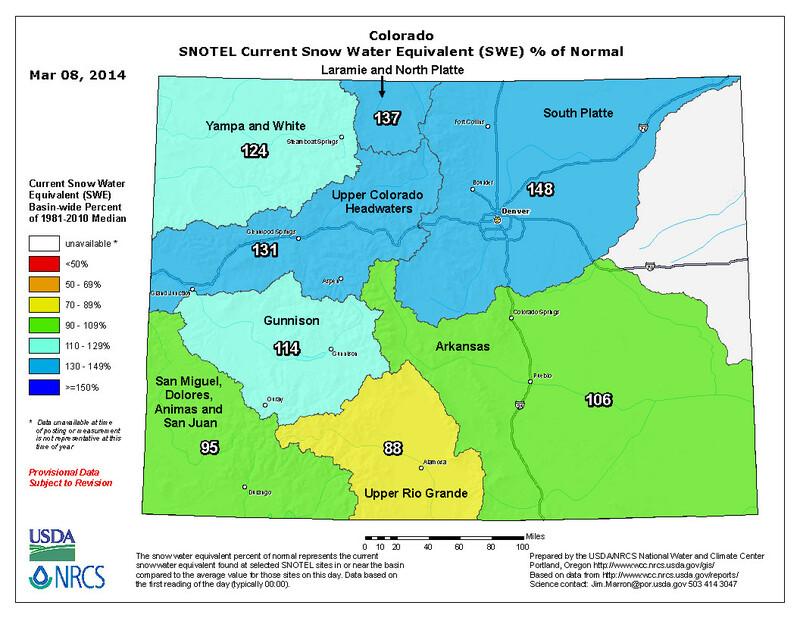 The highest amount of snowpack March 1 was 151 percent of median in the South Platte Basin. Reservoir storage for the state decreased an average of 1 percent, the NRCS reported. However, storage in the Arkansas River Basin decreased 4 percent even though the snowpack increased. Statewide reservoir storage dropped to 89 percent of average. “The most recent streamflow forecasts continue to point toward above- to well-above-normal volumes for this spring and summer in most of the major river basins in Colorado; the exceptions will be the Upper Rio Grande and southwest basins,” the report said.